Today we are going to tell you how to check the Balance of Axis Bank Account from mobile. The bank's account is in any bank, and sometimes we need to know the balance in our account. At the time when we had to check Balance, we had to go to the bank for this. The wrong bank has a long long line. In such a situation, our precious time was also wasted due to the line being detected. In view of this, almost all the big banks of the country have provided mobile number and online facility to check the balance. Through which we can know the amount of money in our bank account sitting at home. Even today there are many people who do not know such information. It is better to go to the branch to check balance, but when the bank is providing us the facility to check mobile number and online balance, we should also save time and money by taking advantage of it. In the previous post, we told you about SBI Bank. If your account is in SBI Bank then you can read the post by searching on the site. Here in this post, we are going to tell you how to check Balance Check of Axis Bank Account, so let us know. The main four ways to know the balance in the account are by going to the first branch, second from online mobile or PC, from the third mobile to Miss Call or SMS, and from the fourth ATM machine. If you do not have an ATM Card, you have three choices left. You may have checked the balance several times by visiting the branch but you should also check online using Miss Call and SMS. If you want to use Miss Call and SMS, you must have a registered mobile number in the bank account for this. If you have not yet registered a mobile number, then first you have to register your number in your account by visiting your branch. Only then can you take advantage of the Miss Call SMS service. Account holders of Axis Bank can use Miss Call to know the amount in their account. You can also know the mini statement with Balance. To know the balance with Miss Call, call the registered mobile number in the bank at 18004195959. When you call, the call will be automatically cut after about 3 seconds and within about 5 seconds, the account Balance message will appear on your mobile. Similarly, for a mini statement, you have to call 18004196969. To know Balance from SMS, type in the message box BAL (last 3 digits of the account number) and send it to 5676782 or 9717000002. Type the MINI (last 3 digits of the account number) and send it to 5676782 or 9717000002 in the message box for the Mini Statement. Once you SMS to these numbers, a few seconds later you will receive an SMS on your mobile which will have information on Balance or MINI Statement. Apart from all these, you can also get help from App to know the balance. If you have an Android phone then you can use Axis Mobile's official app Axis Mobile. This app will be easily available in Playstore. If you want, you can download it from here too. This link will direct you to Playstore. After installing this app on your phone you have to activate it. To activate it, you can get help from your branch or bank's Customer Care. 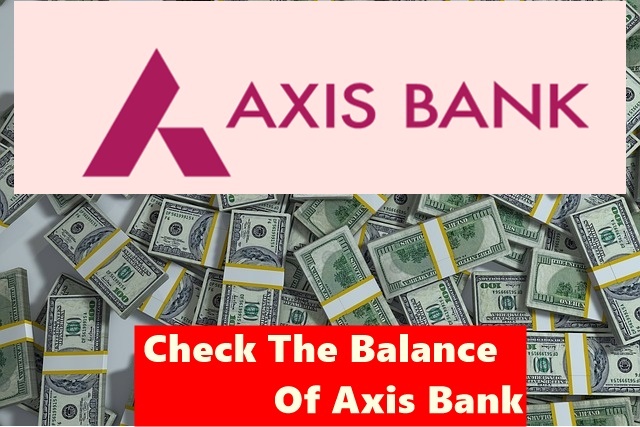 Now you know now how to check the Balance of Axis Bank Account from mobile here we have shared the official numbers of Axis Bank to Miss Call and SMS through which you can easily know the amount and mini statement in your account. Can. However, in order to take advantage of this facility, it is necessary to register your mobile number in your bank account. If the number is not registered then first go to the branch and register the mobile number.